Manohar Ratnam, Ph.D., professor of Oncology and member of the Molecular Therapeutics Group at the Barbara Ann Karmanos Cancer Institute and Wayne State University School of Medicine, is the 2017 winner of the Anthony and Joyce Danielski Kales Endowed Faculty Award for Innovative Cancer Researcher. The Kales Award was created in 2012 at the School of Medicin3e to recognize exemplary and innovative cancer research. The award is given to a WSU faculty member who is affiliated with Karmanos. 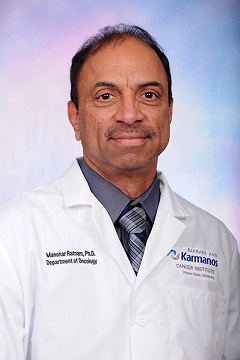 Dr. Ratnam will receive a Kales Award plaque at a special event and Grand Rounds session at 4:30 p.m. Oct. 26 in the Wertz Auditorium at Karmanos' Hudson Webber Cancer Research Center. Dr. Ratnam is being recognized for his publication, "The Amino-terminal Domain of the Androgen Receptor Co-ops Extracellular Signal-regulated Kinase (ERK) Docking Sites in ELK1 Protein to Induce Sustained Gene Activation that Supports Prostate Cancer Cell Growth," published in the Journal of Biological Chemistry. His co-authors include Rayna Rosati, Ph.D.; Mugdha Patki, Ph.D.; Venkatesh Chari, Ph.D.; Selvakumar Dakshnamurthy, Ph.D.; Thomas McFall, Ph.D.; Janice Saxton; Benjamin Kidder, Ph.D.; and Peter E. Shaw, Ph.D. The research is a collaboration between scientists from the School of Medicine, Karmanos and the School of Biomedical Sciences at the University of Nottingham, Queen's Medical Centre, in the United Kingdom. Dr. Ratnam and his colleagues have identified a variety of compounds that prevent a protein called ELK1 from acting as an anchor that directs the androgen receptor (i.e. the protein that binds and mediates the actions of testosterone) to enable the growth of prostate cancer cells. The androgen receptor is critical in the development of cancer cells in the prostate. "Virtually all" prostate tumors have the ELK1 protein, Dr. Ratnam said. Treatment of advanced prostate cancer commonly involves chemical castration, by which a man is deprived of testosterone. The problem with this treatment is that it comes with a host of undesirable side effects, including compromised bone and muscle health, reduced blood cells and cognitive decline. It also may cause depression and weight gain, increased risk of heart disease, loss of libido, impotence, breast tissue growth, hot flashes and fatigue. Dr. Ratnam and his team predict that drugs that are able to prevent ELK1 from interacting with androgen receptors will have no effect on normal tissues in which testosterone is needed for functioning (other than stimulating cancer cell growth). The researchers believe that the drugs will suppress the growth of prostate cancer, including advanced tumors that have overcome castration methods. Such treatments would not entail androgen (testosterone) deprivation, allowing the patient to enjoy a normal level of the important male hormone. "We are very excited about these results," said Dr. Ratnam. "What we published is a critical link in a series of ongoing studies that have led to the new drug discovery. If successful, the studies we are conducting will firmly establish a new paradigm in drug development for prostate cancer of all stages, in virtually all patients. "The new therapies will not only be effective in fighting tumors that do not respond to current treatment but will also dramatically improve the quality of life of the patient by avoiding chemical castration," he added. Dr. Ratnam expects that his laboratory studies into the various compounds will take another three years to come to fruition. He is hopeful that in about 10 years the research will be translated into a specific drug that can be given to prostate cancer patients. "Our goal is to get pharmaceutical companies interested in this research, but that takes a lot of money," he said. "Our job is to make it very attractive to the big pharmaceutical companies." Dr. Ratnam began studying this particular area of prostate cancer research in 2008 when he was at the University Medical Center in Toledo, Ohio. He came to WSU and Karmanos in 2012. He mainly studies the mechanisms of cancer cells in all forms of cancer. "Cancer cells are amazingly adaptable," he said. "It presents a challenge, but it's also an opportunity. That's why you need a battery of drugs to fight cancer cells. However, we want to focus on the minimum of what you have to do to treat cancer." Dr. Ratnam said he is excited to receive the Kales Award. "The Kales Award was a huge surprise and it means a lot to me," he said. "This is a way of formalizing the support I've received at Karmanos. It's a great feeling to receive the award."